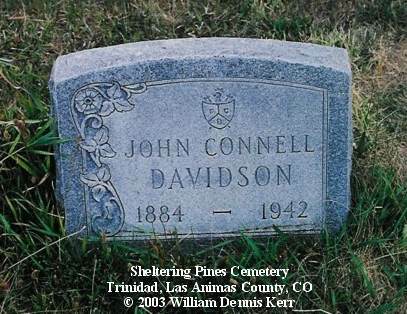 Sheltering Pines Cemetery is on the North end of Arizona Avenue in Trinidad near the Masonic Cemetery. 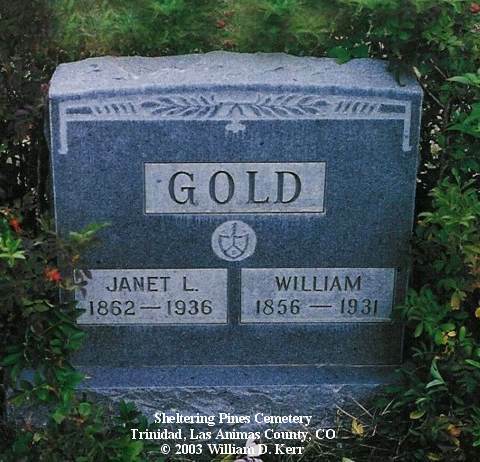 Daughter of William & Janet L. (Smith) Gold, born February 10, 1892 at Cañon City, Fremont County, CO; died June 19, 1980 at Trinidad. 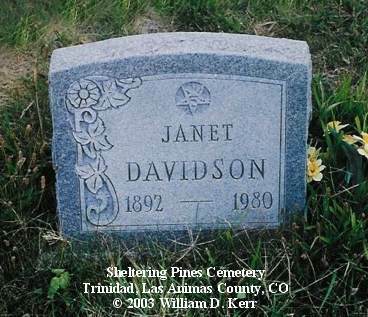 Janet L. (Smith) Gold was born August 14, 1862 in Scotland, died February 26, 1936 in Trinidad. William Gold, Sr. was born October 24, 1856 in Scotland, died November 12, 1931 in Trinidad. 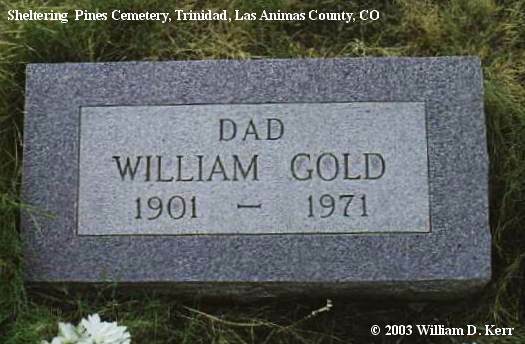 William Gold, Jr. was born January 3, 1901 at Crested Butte, Gunnison County, CO; died October 19, 1971 at Cokedale, Las Animas County. Isabella B. 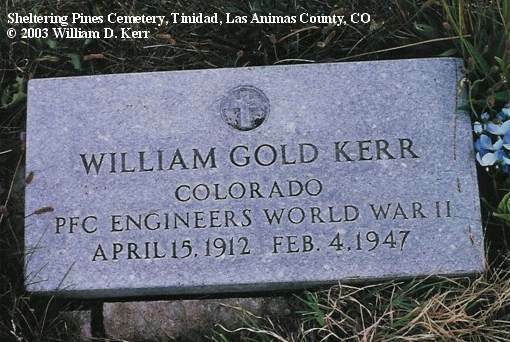 (Gold) Kerr, daughter of William and Janet L. (Smith) Gold, born March 9, 1894 at Crested Butte, Gunnison County, CO; died October 29, 1970 at Albuquerque, NM. 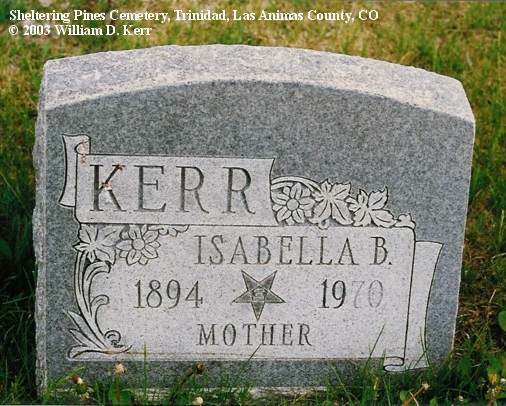 Son of Walter & Isabelle (Gold) Kerr, born at Berwind, Las Animas County; died at Trinidad. 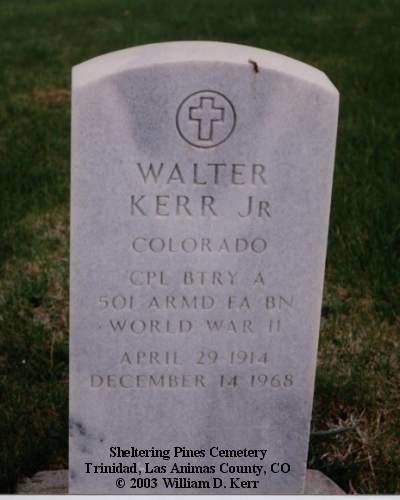 Son of Walter & Isabelle (Gold) Kerr, born at Koehler, Colfax County, NM, died at Trinidad.